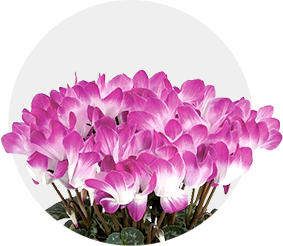 The Indiaka Cyclamen, a unique plant variety available in two colours. INDIAKA® stands out for its totally unique colours! You can recognise it by the extraordinary contrast between the petals’ white base and the vibrant colour at the tip of the flower. The Indiaka® will captivate you by their original contrast of their colours and flowers: petals cut in two horizontally with white and vibrant stripes. 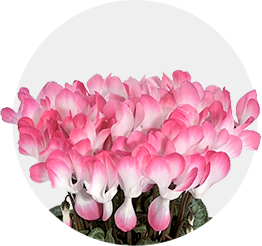 Easy to care for, exceptionally hardy outdoors, the cyclamen is one of the most beautiful colourful flowers in autumn. With INDIAKA®, spice up your gardens, homes and outdoor areas! In the land of the Rising Sun, the cyclamen is considered to be the sacred flower of love. Do you suffer from stinging eyes and a tickly throat? Fill your life with cyclamen! In fact, their leaves naturally release water vapour, which improves the humidity of your room. 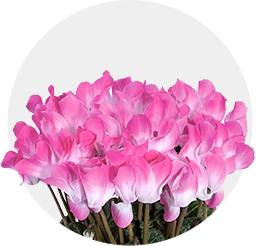 The Cyclamen can just as well be a gift to a family member, a friend or a loved one. 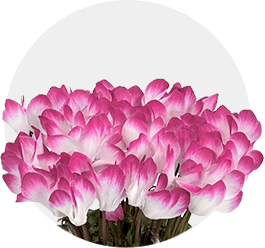 In the language of flowers, cyclamen stand for sincere, lasting love. A strong, authentic and eternal bond, but it can also mean charm, grace or jealousy. Opt for a fresh, young and on-trend Cyclamen. Its vibrant colours and medium size make it THE perfect choice for an original, pretty gift, and easy to display in your home.